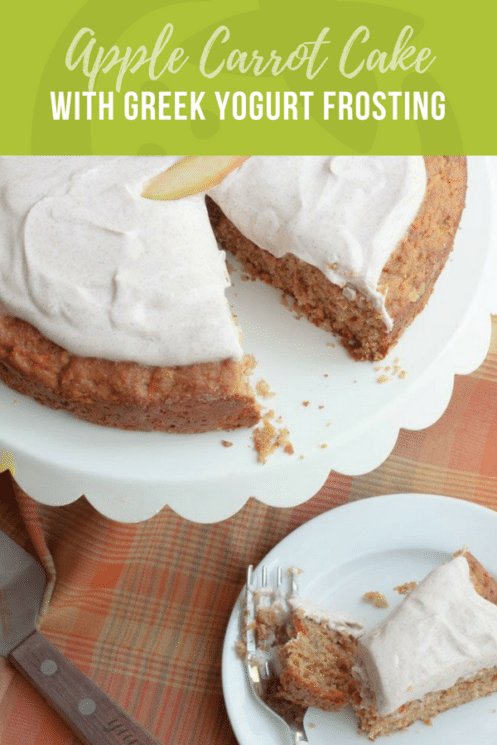 This Apple Carrot Cake topped with a Cinnamon Greek Yogurt is packed with real fruits and veggies and is a delicious lightened dessert for kids! Have some apples you need to use? Or just love apple recipes? You have GOT to try our Healthy Apple Muffins recipe! Let’s talk cake. We all love it, right? So many different flavor combos (this chocolate + coconut one is SO yummy). All the fluffy frostings that you just can’t help but dip your finger into. And kids just can’t seem to get enough. A lot of store bought cakes use so many different food dyes that just seem unnecessary. A lot of kids have real sensitivities to them, but also they are just plain messy! They stain not only your teeth, but kids clothes, carpet and furniture! In my opinion, most of the foods we put in our bodies should be natural colors. Fruits and veggies can be so beautiful and used to create beautiful food without artificial coloring. Plus, it tastes better! I always go back to thinking about my own kids when they were babies. When they had their first birthdays, I couldn’t imagine them digging into a cake being sugar-laden or dye-filled. Looking back, it makes me wonder – what makes us make that switch? We gradually allow all the added preservatives and unknown ingredients into our lives and our kids’ lives. We definitely think about it more with our babies! So I was inspired to create a completely natural cake for you that is full of only good-for-you ingredients and very minimal sweetener. 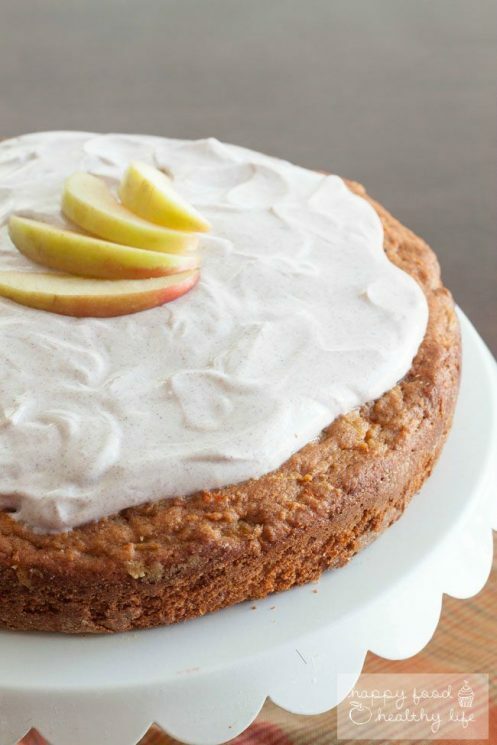 The apple in this cake adds lots of sweetness already, so there’s no need for a lot of extra sweeteners. I like to use my favorite peeler and spatula to make this delicious treat. 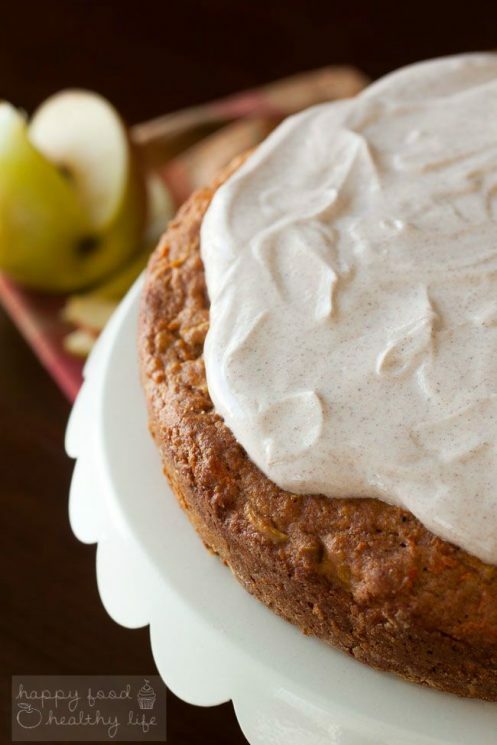 And I wasn’t actually planning on topping the cake with a frosting, but dang… when you can whip up a yogurt frosting in about 30 seconds like this one, why not, right? Besides, what fun is it to watch a smash-cake destruction on a baby’s first birthday without the frosting? Preheat oven to 350F. Spray one round 8-inch cake pan with non-stick spray. In a large bowl, add the egg, brown sugar, coconut oil, agave, Greek yogurt, vanilla, cinnamon, and nutmeg, and whisk to combine. Add the whole wheat flour, baking powder, baking soda, optional salt, and fold with spatula or stir gently with a spoon until just combined; don’t over mix. Grate apples and carrots and fold gently to combine into the batter. Turn batter out into the prepared pan, smoothing the top lightly with a spatula. The batter will be very thick, this is what you want. Bake for about 35-45 minutes or until the top is golden, the center is set, and a toothpick inserted in the center comes out clean, or with a few moist crumbs, but no batter. Baking times will vary based on moisture content of carrots, apples, climate, and oven variances. Bake until done; watch your cake, not the clock and don’t worry if it takes longer to bake than the baking estimates provided. 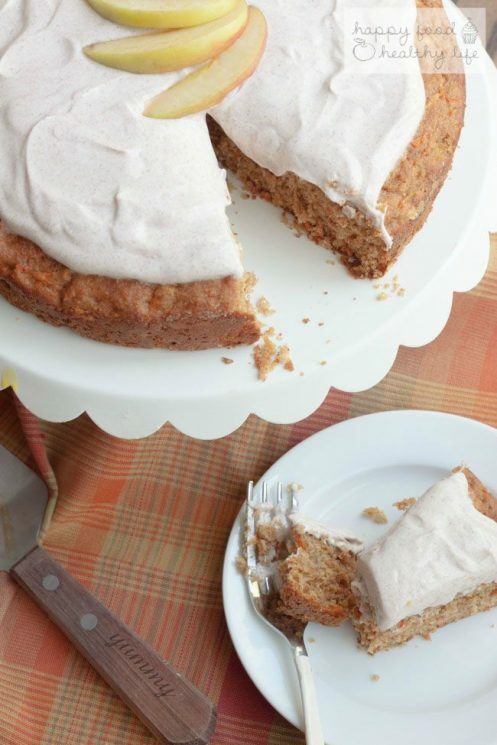 To make “frosting”, simply mix the yogurt and cinnamon together and top on a completely cooled cake. 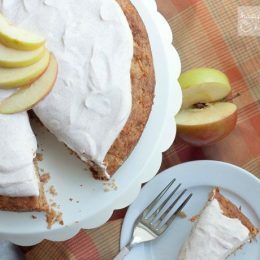 I would guess the apples are peeled and diced like in the recipe for Trisha’s fresh apple cake. Yes! We updated the recipe. Hi! Should the apple be sliced or chopped and should it be pealed? 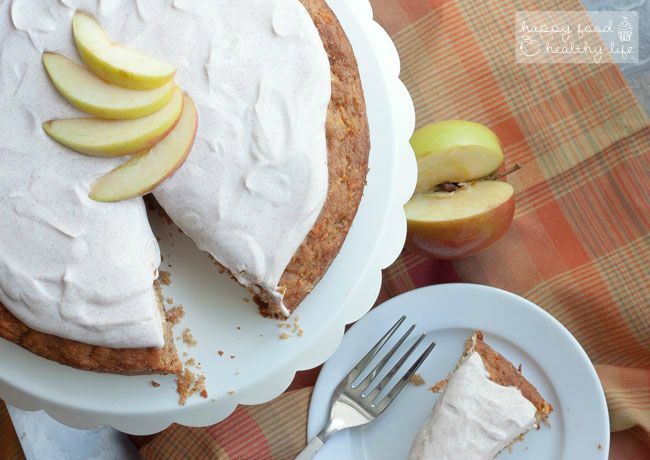 The recipe doesn’t say what to do with the apple? Sorry about that – I will get it updated!